Oil-rich Equatorial Guinea is frequently cited as one of the world’s worst human rights abusers. The government has overseen rampant corruption, failed development policies and a systematically orchestrated clampdown on independent political dissent. On 15th March 2019, human rights activist and the Vice President of the CSO El Centro de Estudios e Iniciativas para el Desarrollo (CEID; Center of Studies and Initiatives for Development) Alfredo Okenve was prevented from receiving an award for his human rights work from the French and German embassies in the country's capital Malabo. In the morning of 15th March 2019, the day of the award ceremony, police officers arrested Okenve's cousin, Joaquín Mangué Obama, and interrogated him on the whereabouts of Okenve in Malabo. Alerted by this news, the embassies cancelled the award ceremony, and according to CEID, Okenve sought refuge at the French embassy, while changing the date of his flight to Madrid to 15th March. He originally planned to travel to Madrid on 18th March for medical examinations as a result of the injuries he sustained in October 2018 (see below). Security forces detained Okenve at passport control of the Malabo airport, handcuffed him, and escorted him on a military plane back to his home in Bata, where he was instructed not to leave the house under any circumstance. His passport and phone were confiscated. As reported previously on the Monitor, Alfredo Okenve and his colleague Enrique Asumu were arbitrarily detained in April 2017 when they boarded a flight to Bata from the country's capital Malabo, where they celebrated the 20th anniversary of CEID. They were held for two weeks until they agreed to pay a fine of 2 million francs CFA (USD 3,325). Okenve has also experienced harassment for his anti-corruption work and his role within CEID, which was at the time a member of Equatorial Guinea's steering committee to join Extractive Industry Transparency Initiative (EITI). CEID withdrew from the committee earlier in 2018 in part due to harassment. CEID was also suspended in March 2016 after being accused of "disseminating among the Equatoguinean youth messages aimed at inciting to violence and civil disobedience” in relation to the Youth Forum on Tolerance and development in Equatorial Guinea in January 2016, organised by CEID. On 25th February 2019, security forces detained activist Joaquín Elo Ayeto, who is also a member of the opposition political party Convergencia para la Democracia Social (CPDS), on accusations that Ayeto is holding information on a coup attempt. According to reliable sources received by Amnesty International, Ayeto was subjected to torture at the police station, resulting in injuries, and received death threats. In a statement on 15 February 2019, 10 human rights and anti-corruption groups denounced the arrest warrant against French anti-corruption lawyer, and founder of anti-corruption legal advocacy group Sherpa William Bourdon by authorities in Equatorial Guinea. Arrest warrants were also issued for 15 other people, accusing them of laundering money and assisting in the finance of terrorism and the proliferation of arms trafficking in Central Africa. Sherpa filed, in 2008, a criminal complaint for embezzlement in France against Teodorin Nguema Obiang, the son of Equatorial Guinea's president, on behalf of Transparency International. A French court convicted Obiang, in absentia, to a three year suspended prison sentence and a fine of 34 million USD, in 2017. Some of the other people facing arrest warrants, such as Onofre O. Otogo Ayecaba and Hector-Santiago Ela Mbang, are already in detention. They were arrested after a failed coup in December 2017. A wave of arrests of members of the opposition party Ciudadanos por la Innovacion (CI; Citizens for Innovation) followed after alleged scuffles took place between party members and police officers at a banned CI rally in Aconibe on 5th November 2017. According to EG Justice, security forces surrounded CI's headquarters on 28th December 2017 in Malabo for twee weeks, while more than 46 opposition members were arbitrarily detained in Malabo, and scores of others in Akonibe and Bata. Fabián Nsue Nguema, lawyer of CI, said on 22nd January 2018 that 135 members of the opposition were detained. "The continuing restrictions of freedoms and arrests, in particular of political opponents, taking place in Equatorial Guinea following the elections of November 2017, represent a source of serious concern. To this day, over 130 people are reported as arbitrarily remaining in detention. The death under police custody of Mr. Ebee Ela, a member of the opposition party 'Ciudadanos por la Innovación', confirms the serious deterioration of the human rights situation in the country. The competent authorities of Equatorial Guinea should properly investigate, without delay, and clarify the causes of his death." On 12th February 2018, a mass trial started against officials, members and supporters of the CI political party, who faced charges of 'rebellion, attacks against authority, public disorder and serious injury and damage' while the prosecutor asked for the death penalty. On 26th February 2018, a court in Mongomo dissolved the opposition party Ciudadanos por la Innovacion (CI) on grounds of 'threatening state security'. Additionally, the court handed down lengthy prison sentences of 30 years to 21 of the CI's members. On 7th May 2018, the country's Supreme Court upheld the dissolution and prison sentences. 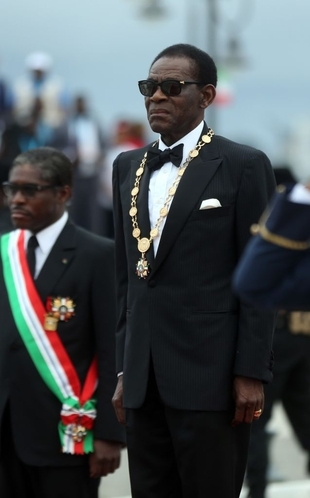 On 4th July 2018, president Teodoro Obiang Nguema issued a general amnesty to "all citizens condemned by the courts... for political offenses in the exercise of their activity, serving or not serving their sentence” and “for all those deprived of their liberty or prevented from exercising their political rights”. Human rights organisations expressed skepticism about the decision. Tutu Alicante of EG Justice said to Financial Times that the decree should not be taken at face value and that "this is just a smokescreen by the president to distract the international community". On 10th October 2018, the commemoration of Equatorial Guinea's 50th year of independence, President pardoned a total of 81 people, including 34 opposition members. Authorities blocked the access to internet on 12th November 2017, when municipal and legislative elections took place, while access to Facebook was reported to have been blocked since the start of the electoral campaign on 27th October 2017. Websites of opposition parties have been blocked since 2013. On 16th September 2017, security officers arrested political cartoonist and activist Ramón Nsé Esono Ebalé outside a restaurant in the country's capital, Malabo. Two Spanish nationals were arrested with Ebalé, and the three were taken to the Office Against Terrorism and Dangerous Activities in the Central Police Station in Mabalo. The two Spanish nationals were released after hours-long interrogation, while Ebalé remained in detention. Ebalé, who had lived outside of Equatorial Guinea for several years and was only in the country to renew his passport, is known for his political cartoons criticising president Teodoro Obiang Nguema Mbasogo. He started the blog Locos TV in which he published a daily cartoon depicting Equatorial Guinean politicians, which was shut down by authorities in 2014, and illustrated the satirical graphic novel La Pesadilla de Obi (Obi’s Nightmare). On 19th September 2017, state television announced that Ebalé was arrested and accused of money laundering and currency counterfeiting. During a hearing at the Malabo Court on 7th December 2017, he was formally charged with 'engaging in counterfeit' under article 283 of the Criminal Code and article 384 of the Law on Criminal Procedure. Ebalé was finally released from prison on 7th March 2018 after spending nearly six months in detention. The prosecutor requested his release stating 'an absence of clear evidence' during a court hearing on 27th February 2018. On 25th May 2017, musician Benjamin Ndong, known as Jamin Dogg, was arbitrarily detained two weeks after he released a song in support of a protest of taxi drivers against the higher price for a license, according to a statement of opposition party Convergencia para la Democracia Social (CPDS; Convergence for Social Democracy). He was released the same day without charge. While article 11 of the Constitution recognises freedom of association, in practice people face several serious obstacles to the full enjoyment of this right. While article 11 of the Constitution recognises freedom of association, in practice people face several serious obstacles to the full enjoyment of this right. All political parties, labour unions and other associations must register with government. Registering a CSO is a complex and time-consuming process, with the strong possibility of politically motivated refusals. CSOs that are not legally registered are unable to access government funding for their work. Furthermore, restrictions on civil society actors working on any human rights issue mean that there are no legally registered human rights organisations in Equatorial Guinea. In this context, CSOs operating in the areas of human rights, rule of law, anti-corruption and anti-poverty are particularly susceptible to government persecution. Opposition political parties and trade unions are also subject to recurrent threats and harassment despite their recognition in law. Freedom of peaceful assembly is guaranteed by Article 13, but in reality anti-government demonstrations are prohibited. Freedom of peaceful assembly is guaranteed by Article 13, but in reality anti-government demonstrations are prohibited. Protest organisers in Equatorial Guinea face severe consequences if they fail to receive prior authorisation, accept compulsory attendance of government officials or comply with restrictions on advertising the gathering. In practice the government rarely approves permits for gatherings. Assemblies that are triggered spontaneously or occur without a permit are typically severely repressed. In March 2015 a protest erupted over the system for granting university scholarships. In the cities of Bata and Malabo, at least 56 people – including children, students and opposition party members - were arrested and held for two weeks without charge. Many victims reported violence during their arrest and detention at the hands of security forces, who acted with impunity. People in Equatorial Guinea are unable to freely express their views and opinions. Media freedom is non-existent while legalised, government-sanctioned censorship severely undermines independent dissent. People in Equatorial Guinea are unable to freely express their views and opinions. Media freedom is non-existent while legalised, government-sanctioned censorship severely undermines independent dissent. A stringent legislative framework enables the government to restrict media through prepublication censorship. A culture of self-censorship amongst journalists thrives out of a fear of reprisals. Nearly all media outlets are controlled by the government and people are unable to access international news sources. The few private media outlets that do exist are also controlled by the government. Even with one of the lowest Internet penetrations on the African continent, at least 20 websites, including social media and independent sites, are routinely blocked by the government.